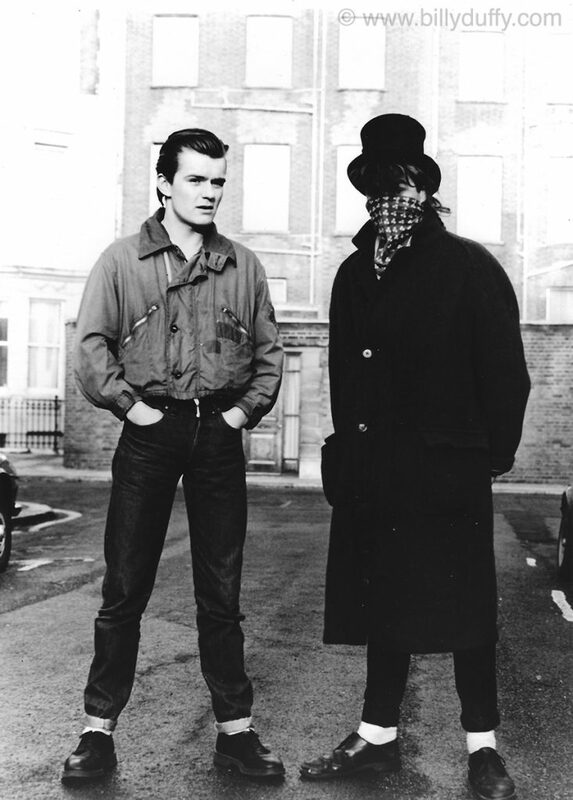 "Taken on that first Death Cult photo shoot with just me an Ian this full length shot really shows me taking on the military chic popular in Post 'Apocalypse Now' Britain especially in London and for fans of Theatre of Hate. The grey jacket is a British 1960’s Helicopter Pilots flight Jacket which was the same as the one worn by Kirk Brandon (from TOH) though his had a non-authentic but cool US Army 101st Division ‘Airborne’ patch. My Levis 501s (with turn ups obviously) were taken in to be less baggy and the white socks and plain classic black Dr Marten lace up shoes complete my look. I think Ian had the clothes on that he arrived from Bradford wearing and he was staying at the place in Brixton’s Clifton Mansions that I shared with “little Ian” who was TOH’s merch guy.